So, you are going on a trip in the summer. Of course, that will not be as fun if without some cold and refreshing drinks. You need a nice and reliable cooler box that can keep your drinks cold and fresh on the road. The cooler box should also be rugged and durable, ensuring that it will not break upon some impact and leak water everywhere. So, what is the best compact cooler box available on the market? Well, the answer should be the Yeti Roadie. If you are looking for a cooler box that is compact, lightweight, robust, and effective, Yeti Roadie can fulfill all the criteria. Available in three different colors, White, Ice Blue, and Dessert Tan, it appears cool and stylish. It has a nice proportional size, with no awkward bulkiness that you often find on other cooler boxes. 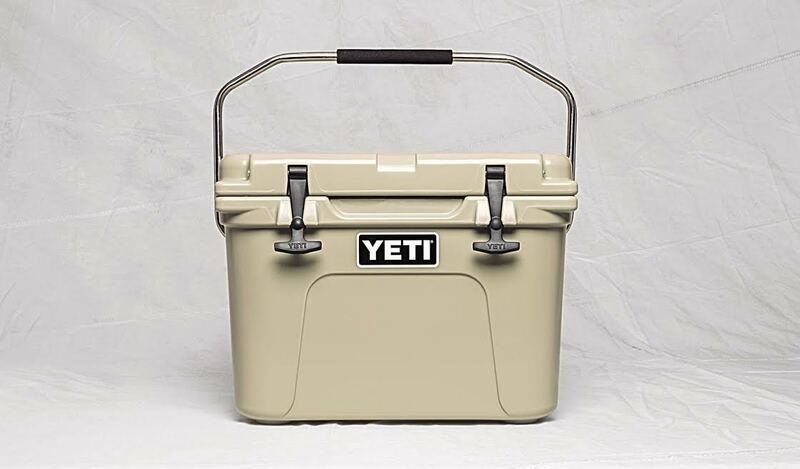 Yeti Roadie is the most compact and lightweight hard-sided cooler box model from the Yeti manufacturer. You can trust Yeti Roadie for any trips and purposes. It is truly well-built. It is tremendously rugged and durable, and it is even bear-resistant. It boasts a rotomolded polyethylene construction for superb strength. No bear can damage and tear the walls, and if you secure the cooler box with a pair of padlocks to prevent the lid from opening, the contents inside become completely secure. It seals the inside from the environment, making it an excellent choice as well for camping and hunting trips. The rod and hinge system is also solid and durable. On the top, you can see a stainless steel handle that allows for easy portability. Yeti Roadie has rubber feet that prevent sliding, and there are integrated tie-down slots for mounting the cooler box in your truck or boat. The performance is exceptional. Yeti Roadie has extra-thick walls equipped with the proprietary pressure injected PermaFrost insulation. Yeti Roadie is able to keep ice for about three to four days, and the inside stays cool afterward. The gasket drain plug is useful and reliable. It perfectly prevents leaking and limits heat from going inside, and you can partially unscrew it to drain water. If you are looking for a reliable cooler box that can last, Yeti Roadie is the way to go. Extra-thick walls with the proprietary pressure injected PermaFrost insulation, for excellent resistance to outside temperatures. Rotomolded polyethylene construction, for excellent impact resistance and long-lasting durability. 20-liter capacity suitable for 12 cans and plenty of ice, also for long-neck bottles. Sealing lid with gasket for preventing air exchange. Rubber T latches to keep the lid closed. Bear-resistant when used with 2 padlocks on both front corners. Tie-down slots molded into the cooler body for mounting in your boat or truck. Full-length, rustproof aluminum rod that connects and holds the body and the lid. Hinge stops molded in the lid for break-resistant performance. Screw-in gasketed drain plug that won’t leak. Full-length stainless-steel handle that locks upright for easy portability. Nonmarking rubber feet keep it from sliding around. Check the best price of Yeti Roadie here!